The problem with giving Lisa a break by taking Amelie off her hands for twenty-four hours, is that she liked it so much, she now wants a divorce so that I'll have the girl every weekend. The only thing keeping us together is the fact that she can't put the ironing board up on her own. 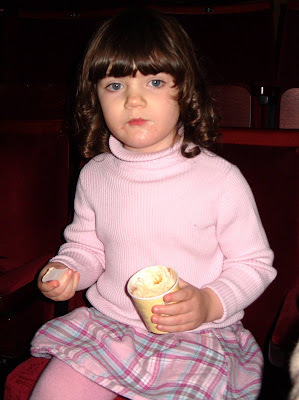 But while we argue over who gets custody of Chloe, the good news is that we managed to spend one last Sunday as a family, by treating Amelie to an afternoon of culture at the Brighton Theatre Royal yesterday. 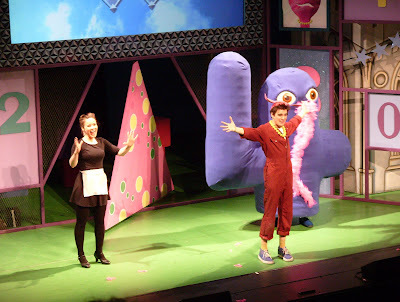 The show we took her to see was 'Numberjacks', so to be honest there was probably more culture in the bacteria on her fingers, but having enjoyed ninety minutes of maths-based fun, she can now count those fingers with ease. For anyone not familiar with the Cbeebies Numberjacks show, it's just your average, everyday tale of a group of googly-eyed numbers who live in a sofa and solve problems using their magical Brain Gain, whilst battling a Problem Blob and a Spooky Spoon. We’ve heard it all a thousand times before. The live stage show promised "all the fun, comedy, music and excitement from the TV, and lots lots more!". And it didn’t disappoint. Assuming your expectations were pretty low to start with. Tickets for this theatrical extravaganza started at £12.50, but fortunately I'm on the mailing list for the Theatre Royal, meaning I was entitled to a special discounted price of just ten pounds a ticket. It meant we were able to purchase three £10 seats for a total of – yes, you've guessed it – forty pounds. I'm not saying they rip you off, but by the time you've paid the booking fee, service charge and 'restoration levy', you feel like calling Trading Standards. It's just a shame they charged us £2.50 for that ice cream. ... but sadly that was the scenery for Spamalot, which was on in the evening. The Numberjacks set was just stuck in front of it for the afternoon. The performers gave it their all, and I'm sure the audience enjoyed it, but the production values left something to be desired. In the TV show, Spooky Spoon floats eerily around in the air. In the stage version, someone walks on looking like a cross between a ninja and a serial killer, and waves a pink spoon on a broom handle. It scared the life out of Amelie, who started shouting "Who's that??!" in a terrified voice. When I told her it was Spooky Spoon, she said "No, the scary man in black!". Anyway, all credit to the actors for doing stirling work with limited resources, but frankly I knew they were in trouble half way through Act II, when Amelie turned to me with a glum expression and said "Daddy, this isn't very good". When three-year-olds start picking holes in the script, you know you've got problems. She's like Statler and Waldorf from The Muppets. And before you ask, no, the show wasn't a sell-out. Having ended the performance on a high, we made our way outside to suffer the considerable low of a sleet downpour and a fifteen minute wait for the bus home. It gave Amelie just enough time to persuade me to spend five quid on a Mickey Mouse balloon from a street trader, after which she began a series of mini-tantrums at everything from our choice of bus seats to our audacity at daring to touch her balloon string. By the time we got home, I was soaked, Lisa was frozen, and Amelie had dissolved into tears. I thought things couldn't get any worse until I got up this morning and found that the £5 balloon had deflated overnight. I had to play the video above at full volume, just to give voice to my despair. Oh dear - life is very unfair! Maybe best to just watch the television in future. I was going to ask if it was a sell-out. Now I have nothing to say. It's always helpful to read articles from other authors and use a little something from other sites.